Visiting Puerto Rico and not visiting Old San Juan, and the forts, is like not having visited Puerto Rico. That's why we want to talk in this blog a little of the history of the Morro fort. San Felipe del Morro was designed to guard the entrance to the San Juan Bay, and defend the Spanish colonial port city of San Juan from seaborne enemies. Puerto Rico as such was considered by the Spanish crown as the "Key to the Antilles"; no enemy ship could navigate its waters without fear of capture. 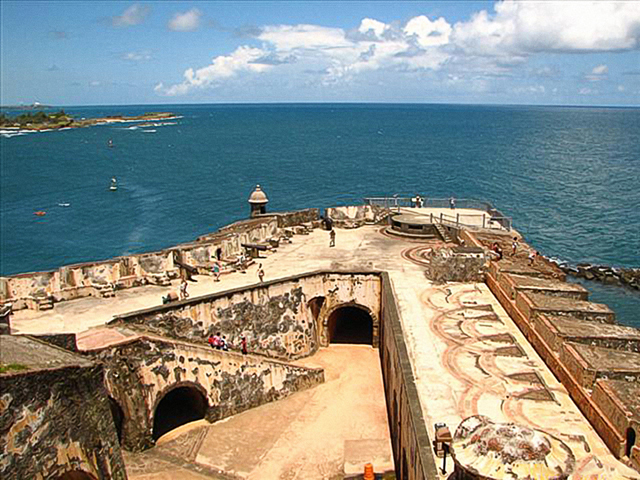 This fort is the largest Spanish fortification in the New World. 1587, Engineers Juan Tejada and Juan Bautista Antonelli lay out the main design for El Morro still seen today. 1595, Sir Francis Drake fails in his attempt to attack El Morro. 1598, the Duke of Cumberland battled his way into El Morro by land and occupied the fort for 6 months. Illness to his men forced the Duke to give up his temporary residence in El Morro and the fort was again returned to the Spaniards. 1625, The Dutch attacked San Juan, but El Morro resisted. 1630, the construction of the city walls started, and were completed around 1678. 1797, the British with several thousand men invaded Puerto Rico and once again attempt to take San Juan. 1843, The Lighthouse of the Castillo San Felipe del Morro was built atop the citadel, but was destroyed during the 1898 bombardment of the city by the United States; it was replaced by the US military with the current lighthouse in 1908. 1898, El Morro fought its final battle when the United States Navy bombarded the fort during the Spanish. The war ended with the signing of the Treaty of Paris, in which Spain ceded ownership of the island of Puerto Rico Philippines to the United States. 1942, as part of the USA’s Second World War preparation, El Morro was fortified with a concrete artillery observation posts and an underground bunker. 1961, the United States Army officially retired from El Morro. The "fort" became a part of the National Park Service to be preserved as museums. 1983, the Castillo and the city walls were declared a World Heritage Site by the United Nations. 1996, El Morro was used as a film set in the motion picture Amistad. Steven Spielberg used it to represent a fort in Sierra Leone where African slaves were auctioned in 1839. The National Park Service supplies you with a map when you pay your entrance fee. You can use that map, and the descriptions of the different parts of the fort, to do a self-guided tour of sorts. 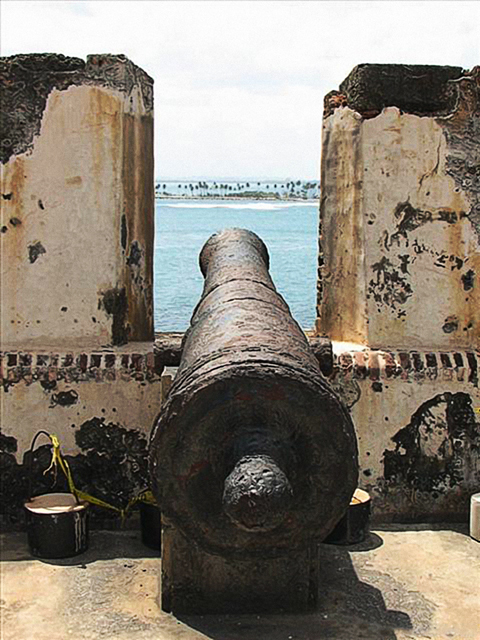 When you visit El Morro, you can sit and watch a short movie about the battles and construction of the forts. It runs continuously all day. You can also attend a free orientation talk every hour. These are led by park rangers, and they are very informative and interesting. The rangers will tell you about life in the old days, what it was like to live in the fort, and they’ll be able to answer any questions that you may have. There are a few free activities and tours available: Life Inside the Fortification: This happens on the Third Sunday of every month throughout the day. A guide and costumed Living History Demonstrators talk about 18th century life in the fort and will have gun and cannon firing demonstrations. There is also a Lighthouse Tour available on weekends at 10:30 am and 2:30pm (ask at desk to sign up). If you don’t want to watch the movie or listen to a park ranger, you can can use your map and go off and explore the fort on your own. 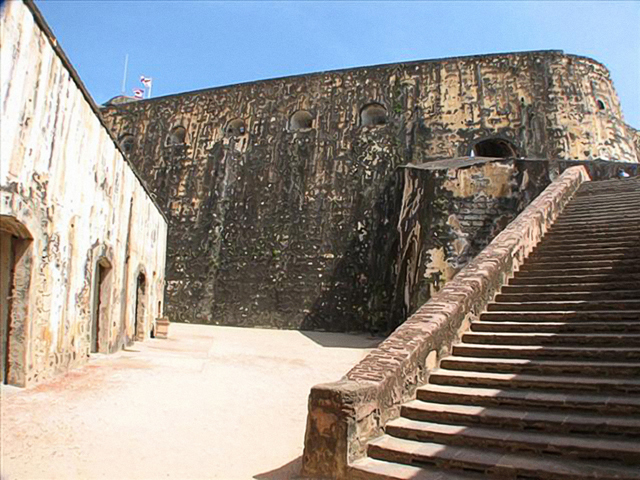 El Morro is a massive structure, with 6 levels that you can visit by using various stairs, ramps and tunnels. Garitas - The garitas, or sentry boxes, are located all around the outer walls of the fort. There are numbers of them that you can go into. These garitas have become a cultural symbol of Puerto Rico – you will see their images on many things, from license plates to shot glasses to tee shirts. These make wonderful pictures. Lighthouse - The lighthouse was rebuilt by the US in 1908 after it was damaged in the 1898 Spanish-American war. The lighthouse is currently surrounded by scaffolding and undergoing refurbishment. El Morro has spectacular views. The large green field in front of the fort is an extremely popular spot for locals to picnic and fly kites. There are also great views of the San Juan Cemetery and the San Juan Bay. Apart from its great history, visiting this fort is spectacular because of its impressive view, the familiar atmosphere, and the beautiful photos that you can take from there. Today this World Heritage Site is a MUST SEE for visitors, also it has accessibility for people with mobility problems. Keep in mind that you can visit Puerto Rico without spending a lot of money if you choose a budget hotel, and use public transportation. Dreams Hotel offers you a good stay in a green and very clean hotel. Near the Morro Fort there are many places to visit that you will also love. Enjoy Puerto Rico. When: 7 days/week from 9:00am – 6:00pm. Closed New Year Day, Thanksgiving and Christmas.